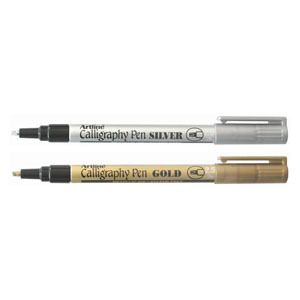 The Artline 993 Calligraphy Pen contains metallic ink made with pigments with reflective qualities. The ink will not bleed through paper and is smudge resistant. The Artline 993 Calligraphy Pen is ideal for invitations, certificates, illustrations and any form of special lettering. 2.5mm tip.